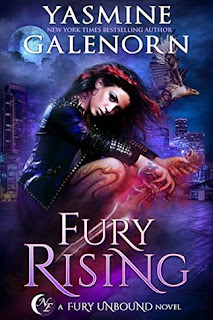 Fury Rising is book one in the Fury Unbound series. When I saw that YGalenorn was releasing a book with mythology mixed in heavily I knew I had to grab it. In this book, the main character is a Theosian, a minor goddess that does the bidding for Hecate, the goddess of the Crossroads. And as you can imagine her missions aren't always easy going. So we start the book meeting Kaeleen Donovan aka Fury, the Theosian (minor goddess). She's out searching for Abominations, soul eaters that are on the prowl for their latest victim. They're hard to take down but Fury isn't one to shirk her duties. She does some other missions from Hecate and we even get face time with the goddess which I was glad to see. The main event is when Hecate tasks her in finding the Thunderstrike, an ancient artifact that has weather magic. Someone stole it and is wreaking havoc with it around their city. The gods and goddesses will not be pleased and Fury has to find it before the goddess Gaia decides to wipe out human kind. In a rich, new environment, Fury Rising is the start of a promising new series. Like YGalenorn's other work, this book is Urban Fantasy with romance aspects intertwined. My favorite bits are the strong friendships the main character always has, as well as the fight scenes. It's not easy on Fury, but it's nice to see her support system backing her at every step. This series has a bit of every paranormal I could ask for including fae, shifters and gods/goddesses. I really enjoyed seeing all the different types of characters. On the romance aspect, I know who I'm rooting for, though there is a slight love triangle feel in the story. But while Fury might have a huge crush on one character I don't think it will work out. We'll see where it goes in the future, though. I do hope we get face time with more gods/goddesses in the next book, I can't wait to see where the series leads. All in all, if you're a fan of YGalenorn's work, or like Urban Fantasy with romance mixed in I think you'd love this book! This sounds good. I have the first two book in her dragon series but I haven't started them yet. It seems like a lot of people like her work. I love her books! Her writing style is great for me, but I have seen some not love it. I like different sorts of characters in urban fantasy. It's nice to see them getting away from vampires and werewolves. Uh huh! There is a were in this one, but it's a bird shifter!! Oooh, I've been looking for more UF and will have to check this out! How many new ones has she? She's knocking them out this year. This one is her indie one, pretty sure her dragon book two came out recently and her Whisper Hollow book two comes out later this year. I hope you enjoy if you try it Melliane! I do like the sound of this one. It sounds pretty fascinating. I am not always a fan of love triangle themes. It depends on how they are written. I am definitely going to watch this series. It's not huge but she likes one (for like forever) then starts liking another. I really don't think YGalenorn will have to go towards the first one though :P But you never know!!! I love when they have good friendships and those are shown as well. I've not tried her out yet but really need to. I didn't like her other series - with the sisters - but I'm always willing to give an author another try. I will warn you the writing styles is the same in all of her series. So there's a chance you might not like this one. If you do give it a try though I hope you love it!!! This sounds like a great start to a series. I've been wanting to try this author for a while now. Since it is a beginning of a series, maybe I'll pick it up. I wonder if it has an audio. Great review. I just want to try all of her stuff. lol. Her books sound amazing.